Please note: the map below shows the placeholder for Brookhouse Holiday Cottages. 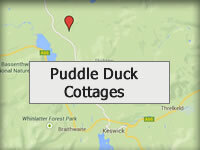 These cottages are in the same location as Puddle Duck cottages so the directions are the same. From the M6 motorway: Take Junction 40 (Penrith) and follow the A66 West towards Keswick (approx. 15 miles/20 minutes). Do not take the first turning into Keswick but continue on until a roundabout. Take the third exit onto the A591 signposted for Carlisle (not Windermere). After approx. 6 miles (10-15 mins) you will drive past a large church on the right, after this turn right for Bassenthwaite village. It is 0.5 miles to the village – continue on this road passing the village green on your right, then around a sharp bend until you reach our cottages on the right, the stream and wooden bridge over to your left. You can check prices and availability HERE. If you prefer you can send an enquiry using the form below or by direct email to info@puddleduck-cottages.co.uk. Please include full information of dates, number of people and the cottage you prefer. Alternatively you can also call us on 01768 776828.